Hot on the heels of a price reduction for all Xbox 360 consoles, Microsoft is now giving holiday buyers even more value by including two great games with every Xbox 360 console and Xbox 360 Elite, a retail savings of $90 for consumers. 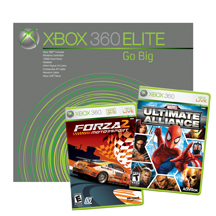 The acclaimed “Forza Motorsport 2” (Microsoft Game Studios) and “Marvel Ultimate Alliance” (Activision) will both be included for the recently reduced prices of $349.99 (U.S.) for Xbox 360 and $449.99 (U.S.) for Xbox 360 Elite. Both bundles will be available retail-wide by the end of October. Xbox 360 offers the best value this holiday and is the only place you can play all the titles in the greatest holiday line-up of video game in history. This line-up includes “Halo 3” (MGS), which became the fastest-selling video game ever and is making history as one of the biggest entertainment launches of all time. “Halo 3” (MGS) is just one title in an incredible holiday line-up that are all only available on one game platform, Xbox 360. Starting with "Madden NFL 08" (EA Sports), Xbox 360 has an unprecedented string of no less than seven blockbuster titles, each of which we expect to sell at least a million units, including "BioShock" (2K Games), the record breaking "Halo 3" (GS) "Project Gotham Racing 4" (MGS), "Mass Effect" (MGS), "Guitar Hero III: Legends of Rock" (Activision) and "Call of Duty 4: Modern Warfare" (Activision). Xbox 360 is home to the most critically acclaimed next generation games according to Metacritic.com, the leading aggregator of game reviews from more than 100 publications. Of the top 30 next generation game titles on Metacritic.com, 21 are on Xbox 360 and five games exclusive to Xbox 360 score above 90 out of 100. In fact, “Forza Motorsport 2” (MGS) has received an aggregate review score of 90, producing a “Universal Acclaim” rating. The most-respected game reviewers have spoken and according to them, Xbox 360 has more than double the games of the Playstation 3 and Wii receiving a score of 90 or higher. 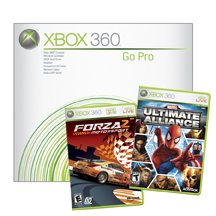 360-Hq Game Database: Games for Xbox 360"
In the world of Odd, there has been a new addition to the family, albeit a crippled addition, but an addition nonetheless. The newest member of the Oddworld family goes by the name of Munch. Munch is ..